I don’t, as a rule, tend to think of public toilets as good places to indulge in photography. However, I was in a pub/restaurant this afternoon (the Fairy Glen in Dwygyfylchi, in case you were wondering – NB I recommend their roast duck in cherry sauce if you happen to be passing through and looking for a tasty, large and reasonably priced meal) and, when I nipped to the gents’, I saw a poster that amused me. Since there was nobody else in there at the time and I happened to have my phone (with built-in camera) in my pocket, I decided to take a quick snapshot of it for posterity. 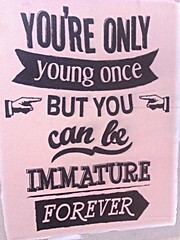 You’re only young once but you can be immature for ever. Another limited free version of a payware app that I have looked at is one called Survive Japanese! This one’s a bit different from the others in that it is an adventure game. The premise is that you have just arrived in Japan armed with little more than a desire to get stuck into learning the language; you have to wander round, exploring and interacting with things, gradually building up a knowledge of Japanese as you go. There are regular quizzes, some listening-based and some reading-based, and you can initially approach them in a trial-and-error fashion if you don’t already know how to read hiragana or kanji. I first tried the app when I was just starting on the hiragana (I had tried to learn them several years ago, but forgotten pretty much the whole lot) and found that it worked well in combination with the other resources I was using as a means of cementing the knowledge of the kana, as well as helping me to learn some basic vocubulary in context. Unfortunately the free version seems quite limited in how far you can get (or perhaps I just wasn’t patient enough). Again, I might consider getting the full version at some point if it’s not too expensive, but for now I’m concentrating on other resources. In anticipation of a time when I’ve learned a bit more Japanese and will want to be able to look up words, I have installed a Japanese dictionary. The one I found is called aedict, and seems to be a pretty good one. You can enter Japanese words in kana (if you have a suitable input method – see below) or romaji (i.e. Japanese written in the Roman alphabet) or English words and there is also a kanji search option, which appears to offer several search methods. The only one I’ve tried so far (since I haven’t yet done much with kanji) is drawing recognition, which gets you to trace the kanji on the screen with your finger and then tries to match it and gives a list of its best suggestions. I have found that it quite often seems to completely miss the kanji I’m aiming for, even if I’ve drawn what appears to be a fairly good approximation, and offers some suggestions that look nothing like what I drew. I assume that with a bit of practice I’ll probably get better at making it recognise what I’m drawing. There were quite a few options available to enable Japanese input. The one I’ve settled on, at least for now, is called MultiLing Keyboard. As the name suggests, this actually supports many different languages, so it’s potentially quite useful to me beyond my Japanese learning endeavours (for instance, its Welsh mode has a very handy dead-key feature for adding accents to characters, which is a bit quicker to operate than the default keyboard’s accented character input and supports accents on ‘w’ and ‘y’, which are needed in Welsh). Regarding Japanese, it seems that you have an option of typing the characters in romaji and having them automatically converted to the kana syllabary of your choice (using the equivalent of caps shift to switch between hiragana and katakana) or having a keyboard arranged by initial consonant, where you hold down the key and flick in the required direction to select the vowel of your choice). So far, I’ve mostly been using the latter method, as it gives extra practice at recognising the kana. There is also a drawing recognition mode, a bit like the one in aedict (see above) and seemingly just as flaky; this can (in theory) recognise kana and various non-Japanese symbols, including Roman letters, as well as kanji. Finally in this round-up of Japanese learning apps I must mention one that I’ve actually been using for some time and have just started using for Japanese. This is Anki, a multi-platform flashcard program that operates on the spaced repetition principle (essentially, reviewing material less frequently as you get a better grasp of it). The Android version is actually called ankidroid. There are desktop Anki clients available for various operating systems (I have one running on Linux) and also a web interface. You can synchronise all these together using a free web account, which enables you to create or revise flashcards wherever you are. I’ve found that having it available on my phone makes it a lot more convenient than having to go to a computer in order to run a set of flashcards. There are quite a lot of shared decks of cards available or you can create your own. So far, I’ve mostly used my own decks (although I did download quite a good one of frequent New Testament Greek vocabulary) and I’ve only really used Anki for language learning purposes, although it can also be used for all kinds of other things. Amongst the many languages I’ve dabbled with over the years is Japanese. I’ve always (or at least for quite a long time) had an interest in the language and culture of Japan, partly because they are very different to what I’m used to. My previous attempts to learn more than a few basic phrases of Japanese have, however, been hampered by the difficulty of learning the writing system. Having recently acquired a new Android phone, I decided to have a look at the facilities that had to offer for learning Japanese, especially how to read it. I was pleasantly surprised. So far I have only explored some of the free apps that are available, but there are plenty of these and some of them are extremely useful. All of these apps are (or at least were) available on the official Android Marketplace. I won’t go into great detail about the Japanese writing system here, since there are plenty of good sources of information available, such as this Wikipedia article. However, learning to read the two kana syllabaries (especially hiragana) is a high priority for learning the language, as is beginning to get a grip on the basics of kanji. Learning to write them too is not a bad idea. Repeated exposure is essentially the only way to achieve these goals. The main app I have been using to learn the kana is one called TenguGo Kana, which provides a series of quizzes on both hiragana and katakana, with diagrams and animations to show how the characters are written (stroke order is quite important for correct writing of Japanese; the same is true for kanji), as well as examples of words using them. I’ve just finished working through all the quizzes, but they will still be useful for revision purposes later on. The app also includes handy kana charts for reference. For learning to write (or draw) the kana, I have found an appropriately named app called Kana Draw, which has been quite useful. This puts up outlines of the various kana and gets you to trace them using the appropriate stroke order, which helps to get the shapes better established in your mind so that you can more easily write them as well as recognise them. I’ve found it quite helpful to name each kana out loud as I trace it, as a means of consolidating my knowledge of the sounds represented as well as the way of writing them. Unfortunately there doesn’t seem to be a straightforward way of selecting just a subset of each syllabary to test, which means that while I’m still learning the katakana I’m getting faced with a few symbols I don’t yet know (I had already become familiar with all the hiragana before I found this app). I have also installed an app called Kanji Flashcards. You can probably guess from the title what that one does :-). I haven’t made much use of it yet, as I’m still concentrating mostly on learning the kana, but when I get on to learning kanji this promises to be a handy study tool. Another useful app I found is an interactive textbook called HJ Lite. This is actually a free, limited preview of a payware app called HumanJapanese, which is essentially a complete basic Japanese course with about 40 chapters. The free version is limited to the first 8 chapters, which introduce the hiragana and a few basic phrases. There’s quite a lot of discussion surrounding the basic information that’s presented, including useful observations such as several observations about how perceived difficulties in the Japanese writing system are in fact similar to features of our own system, e.g. the addition of a single stroke can completely change the meaning of a word, just like there’s only a subtle difference between “interior and inferior” if you actually stop to think about how the letters are written. It also has some advice for things to look out for when writing the characters. I was impressed enough with this course that I am seriously considering getting the full version, although I’m inclined to give some of my existing Japanese learning materials another try first, now that I’ve got my phone to help me learn to read and write.